Welcome to our Apple iPods page. It is remarkable to think that Apple iPods allow you to carry around your entire music collection in your pocket, and are now also video players too! If you need new music for your Apple iPod, don't forget to Download Apple iTunes. Below you will find an overview of the Apple iPod, as well as some of the best sites for buying Apple iPods in the UK. The Apple iPod has now become a Video iPod, so as well as your favourite music, you can now watch films, music videos or TV shows (downloadable from the iTunes store). The new Video iPods boast a colour screen, and come in a choice of colours and hard drive sizes. An Apple iPod is a small portable device with a hard drive and colour screen, which allows you to play music and video and store your digital photos. Which file format standards are used to save the songs on Apple iPods? MP3 files, AAC (Advanced Audio Coding, designed to replace MP3), MP3 VBR, Audible, AIFF, Apple Lossless and WAV. Which video formats can Apple iPods play? How many songs can Apple iPods hold? How do you transfer songs and videos onto Apple iPods? Just download the Apple iTunes software. This is song management software which runs on your Apple Mac or PC Computer. 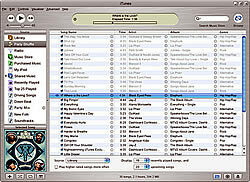 The software allows you to organise music files on your computer before transferring them to your iPod. The software also allows you to put music from your CD collection onto your iPod, or to buy the latest music, music videos and TV shows from the iTunes music store. What sort of battery do Apple iPods have and how long does it last? iPods are equipped with rechargeable Lithium-Ion batteries, and can give up to 20 hours of music playback. The iPod battery can be charged up to 80% capacity in 3 hours; a full charge takes 5 hours. Rechargeable batteries have a limited number of charge cycles and may eventually need to be replaced, and Apple runs a battery replacement service. You may also be interested in our review of the cheapest iPod, the iPod Shuffle. www.ilounge.com - Cool US site for all things iPod and iTunes. www.eshopbrokers.com - A selection of cases and accessories for iPhone, iPod Touch, iPod Classic & iPod Nano! We provide you, the customer, with fast delivery, great prices, excellent products and fantastic customer service! Would you like a link to your Apple iPods site above? Then contact us to request your link. Please note placing a link to us is no guarantee that we will reciprocate - we will only place a link to you if we deem your site to be appropriate (i.e. has suitable content related to Apple iPods and is indexed by Google).